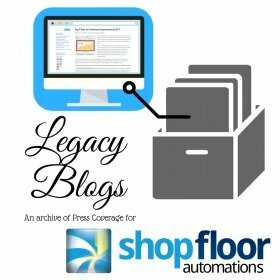 We know from years of experience that legacy machines are still an important part of the operations for many shop floors. In this edition, there is a heavy focus on our USB to Floppy solutions. Back in 2010, we remember when the Floppy Drive Emulator made it’s New Product debut with Modern Machine Shop. This article states this product will “replace 3.5-inch floppy disk drives and media used to store NC programs and other CNC-related files used on the shop floor. The floppy drive replacement features a USB interface to transfer files from a PC with a USB port to virtually any CNC control with a floppy disk drive.” Read the rest of the piece here. In September of 2016 they shared our announcement of a new hire, with our brand new Marketing Coordinator. We have been in business for close to 20 years, with many customers having been with us for over a decade. We would love to start a long term relationship with your shop floor to help increase OEE and productivity. Call (877) 611-5825 or fill out a contact form!